University chaplain Joe Eldridge visits the university pool almost every day for what he calls his “laps of gratitude.” For him, paddling through the cold water is a spiritual experience as much as it is physical exercise. “Thank goodness that I can do this,” he thinks to himself with each lap. His commitment to this practice reflects the dedication he has to his true passion: social justice. Now, a new endowment bearing his name will associate Eldridge with this mission for years to come. Assistant vice president of Campus Life Fanta Aw spearheaded efforts to create the Joseph T. Eldridge Social Justice Alternative Break Endowment, which will help students with financial need participate in AU’s Alternative Breaks program—a program Eldridge created. 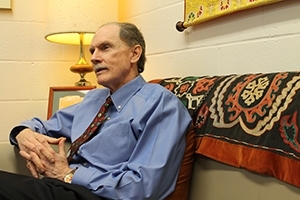 In 1999, Eldridge hung a simple flier in the lounge of the Kay Spiritual Life Center. The paper advertised a spring break trip to aid Honduras in relief efforts following the devastation of Hurricane Mitch. Students flocked to the opportunity, planting the seeds for what would become a cornerstone of the AU experience. Responding to that demand, the Alternative Breaks program has expanded under the roof of AU’s Center for Community Engagement & Service to offer around 15 student-led trips across the world each year, during which students explore social justice issues from HIV/AIDS in South Africa to refugees in Israel and beyond. “It is an important—I would say necessary—complement to the academic learning that takes place here,” said Eldridge, who also serves on the board of directors at the U.S. Institute for Peace. As Aw points out, however, the university recognizes that the cost of traveling abroad can prove prohibitive for many students seeking such an impactful experience. To that end, she set in motion fundraising efforts for this new endowment. Eldridge’s wife Maria Otero believes Aw got it right when naming the endowment for her husband. She points out Eldridge’s 1970 founding of the Washington Office on Latin America, a highly influential organization on human rights in the area. Though she might be biased, she knows a thing or two about the field; she recently served as Undersecretary of State for Civilian, Democracy, and Human Rights under Former Secretary Hillary Clinton. While Eldridge has inspired many students to different careers, studies, and life paths through Alternative Breaks, he himself is an alumnus of AU’s International Peace & Conflict Resolution program and of the neighboring Wesley Theological Seminary. In light of his academic, personal, and professional pursuits in these areas, Otero is thrilled that the endowment will continue her husband’s work decades into the future, just as the Washington Office on Latin America has, now in its 40th year. “He’s loved working with the students so much that having this be a part of his legacy at AU gives me great joy,” she said. In the meantime, Eldridge will continue his daily visits to the university pool, each lap and each step back to his office one of thanks—thanks for the ability to pursue his passions both in and out of the water. Support the Joseph T. Eldridge Social Justice Alternative Break Endowment.